Sen. Bernie Sanders, I-Vt., is traveling to Kentucky, Ohio and Pennsylvania this weekend to rally against the Republican tax cut bill. WASHINGTON — Sen. Bernie Sanders is traveling to Kentucky, Ohio and Pennsylvania this weekend to rally against the Republican tax bill, his office told NBC News, keeping up a brisk pace of political activity since leaving the presidential race last year and ahead of a potential second one in 2020. Sanders, who held a similar series of rallies across the country this year to oppose the repeal of the Affordable Care Act, is using the "Protecting Working Families Tour," which is also organized by MoveOn.org and the Not One Penny coalition, to pressure on-the-fence GOP senators before a vote on the tax bill, President Donald Trump's top legislative priority. Sanders, an independent from Vermont who is up for re-election next year and is considered a possible presidential candidate in 2020, has continued to keep up a campaign-like schedule of events across the country. During the fight over repealing Obamacare, he visited Maine, Kentucky, Nevada, Pennsylvania, Ohio, Michigan, Kansas and West Virginia, including multiple stops to some states. He's also given a series of high-profile policy speeches at places like the Carnegie Endowment for International Peace. Senate Minority Leader Chuck Schumer, D-N.Y., created the position of "Outreach Chairman" for Sanders this year. But the trips also allow Sanders to stay in touch with his loyal national base and nurture connections across the country while working to defend policies he cares about. Sanders has been involved in other efforts against the tax bill, such as leading a recent conference call organized by MoveOn.org that attracted 11,000 callers and thousands more online. 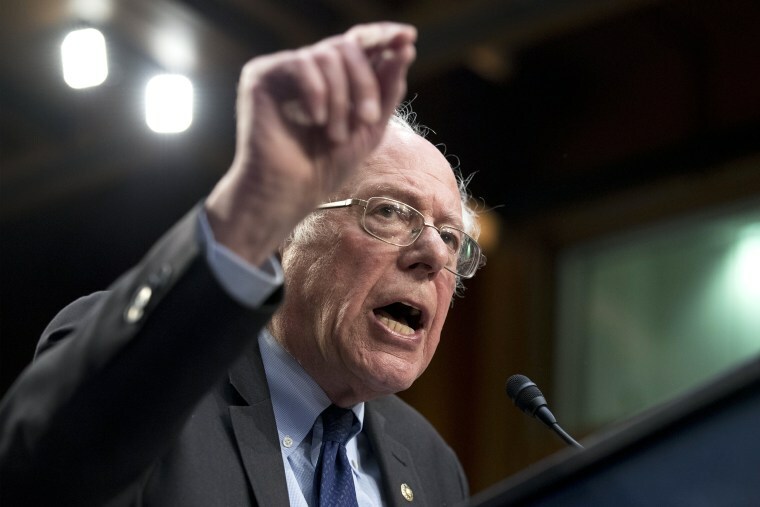 In addition to condemning the bill for reducing taxes on the wealthy, Sanders is hoping to use the tour to argue the tax plan would pave the way for cuts to Social Security and Medicare, which have proved politically deadly for Republicans in the past. The bill is expected to raise the deficit by $1.4 trillion, which the nonpartisan Congressional Budget Office recently say could trigger an obscure budget rule that Democrats warn could force Medicare cuts. "This legislation goes well beyond taxes," Sanders wrote in an email that will be sent to supporters Monday. "Mark my words. If passed, the Republicans will then rediscover the 'deficit crisis,' and push aggressively for massive cuts in Social Security, Medicare, Medicaid, education — higher education in particular — nutrition, affordable housing and more." "That is why I am going on the road this week to talk directly to working people," Sanders added. Entitlement reform has long been a priority of House Speaker Paul Ryan and other GOP leaders, and Rep. Kevin Brady, R-Texas., the chairman of the tax-writing House Ways and Means committee, said on MSNBC's "Morning Joe" this month that lawmakers would soon be "turning toward welfare reform and tackling the entitlements in a way to save them." Republicans say the tax cuts will pay for themselves by stimulating the economy, but Democrats and many experts don't buy it. In a letter sent to Ryan and Senate Majority Leader Mitch McConnell on Monday, Sanders asked for details on what will have to be cut. "Before the Senate votes on tax legislation that adds over $1.4 trillion to the deficit, you owe the American people a specific and detailed explanation as to how the Republican Congress will achieve its commitment of balancing the budget," he wrote.